McKinsey found that return on equity is 53% higher on average for companies ranking in the top quartile of executive board diversity while EBIT margins were 14% higher on average. Diverse employees are three times more likely to leave an organization than non-diversity workers. If just 10% more employees feel included, the company will increase work attendance by almost one day per year per employee. Companies with gender, ethnic and racial diversity are at least 15 percent more likely to experience above-average financial returns. Companies that address inherent and acquired diversity are 45% more likely to improve market share and 70% more likely to capture a new market. In a survey by Forbes magazine of 321 large global enterprises with at least $500 million in annual revenue, 85% agreed or strongly agreed that diversity is crucial to fostering innovation in the workplace. Return on Equity: On average, companies with the highest percentages of women board directors outperformed those with the least by 53 percent. When employees think their organization is committed to, and supportive of diversity and they feel included, employees report better business performance in terms of ability to innovate, (83% uplift) responsiveness to changing customer needs (31% uplift) and team collaboration (42% uplift). The team at Diverst have been great partners in building out our own instance. They're open to new ideas and we've seen several of our suggestions integrated into their updates, not just for us, but for all their clients. 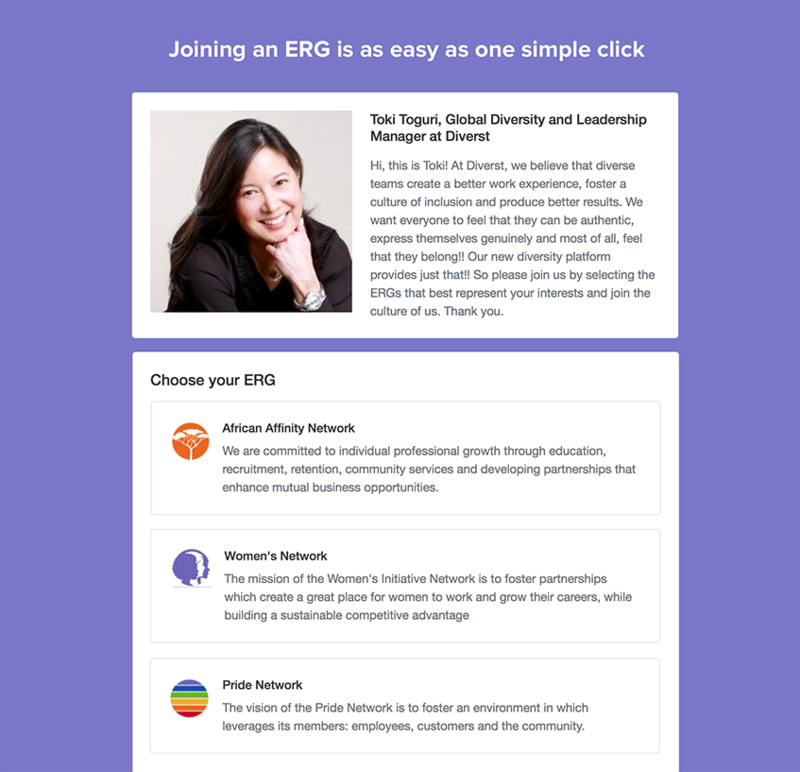 There's no one out there doing what Diverst is doing for ERGs and we look forward to using this platform to engage and scale our Employee Resource Groups worldwide.